Our equipment and experience enable us to fabricate and perforate metal to exacting standards. We have a talented and experienced team of engineers, technicians, and welders that can help with any forming, notching, bending, punching, or fabrication request, and the machines and tools to get the job done right. We offer a wide range of fabricating capabilities, including punching, forming, perforating, welding, laser cutting, light stamping, custom tooling and shearing. Our facilities and equipment allow us to do small and large production runs. We will assist in the design and development of prototypes for larger projects. We offer first article inspection to ensure the quality and specifications of your component before we undertake a final production run. Accurate Metal Fabricating has been punching shapes into metal for seven decades. We have dozens of perforating presses, multiple CNC turret punch presses, and hundreds of tools to cover any metal punching requirement. We punch material as thick as 1/8" and as thin as 28 gauge. We process material up to 5' wide and sheets as long as 10' feet. 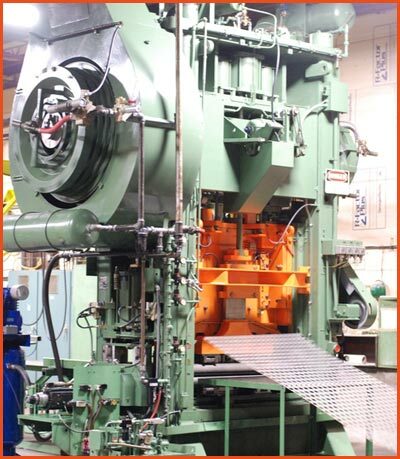 We can even punch coils hundreds of feet long on one of our perforating presses. Our newest turret press is a 33 ton, 58 station, CNC Amada EMZ 3610 with the largest bed commercially available at 60"x100". The large bed enables our customers not to be limited by size in their design. Complementing our large bed are two other Amada turret presses. Our 33 ton, 58 station, CNC Amada V358K with a 50"x80" bed and our 22 ton, 31 station, CNC Amada V255 with a 50"x50" bed. Accurate has the equipment and expertise to accommodate your most complex parts. With multiple machines, hundreds of tools, and nearly 75 years of experience, Accurate can handle essentially any forming/bending request. Contact us today to discuss your needs. Accurate Metal Fabricating's precision sheet metal fabrication capabilities really shine when it comes to forming and bending metal. With nearly 75 years of experience and multiple Amada and Accurpress press brakes to accommodate your product requirements, we provide our customers high-quality, precision forming of material up to 10 feet wide. Our large library of tools accommodates most forming requirements. We also develop custom tooling to meet your design needs. Our newest press brake is a 143 ton, 8 axis, CNC Amada HDS 1303NT, which enables us to accommodate customers with larger complex parts up to 10 feet wide. Complementing our Amada 1303NT is our 88 ton, 8 axis, CNC Amada HDS 8025 with the ability to bend material up to 8.5 feet wide. Our multiple 100 ton and 60 ton CNC Accurpress press brakes provide solutions to bend material lengths up to 6 feet. Accurate has the equipment and expertise to accommodate your most complex parts. With multiple machines, hundreds of tools, and seven decades of experience, Accurate can handle essentially any forming/bending request. Contact us today to discuss your needs. In addition to the broad capabilities of Accurate Metal Fabricating, the Accurate family of metal working companies also includes Accurate Perforating. For more than 70 years, Accurate Perforating has been providing a wide range of perforated materials and components for use in retail, agricultural, architectural, audio, electronic, HVAC and many other applications. With state-of-the-art machinery and engineering expertise, Accurate Perforating perforates holes ranging from .045" to 4" in diameter in a variety of metals and other materials and deliver them in basic sheets, coils or fabricated components. Accurate Perforating also maintains an immense tooling library with more than 2,000 ready-to-run patterns, from basic holes and slots to hexagons and cloverleaf. If the pattern you're looking for is not in stock, custom tooling can often be developed to meet your specific needs. 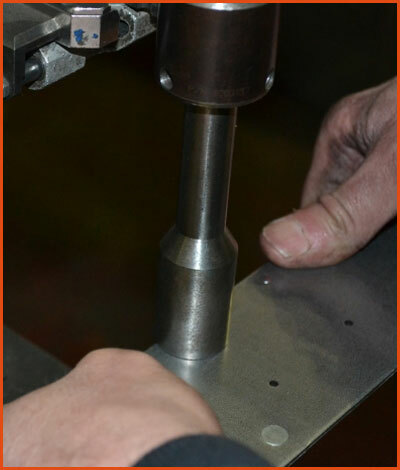 Like Accurate Metal Fabricating, you'll find the team at Accurate Perforating is ready to collaborate on your project, providing the same superior level of service and exacting attention to detail to help turn your ideas into reality. 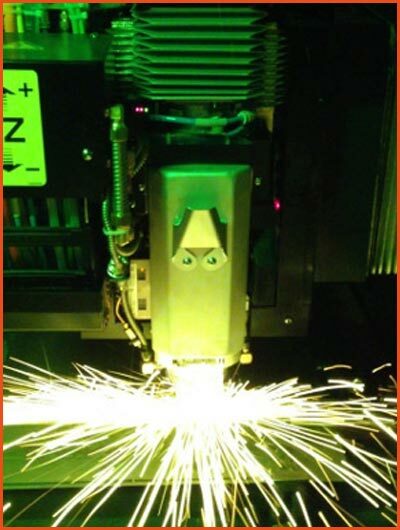 On top of CNC punching, forming, bending, welding, and perforating, Accurate Perforating & Metal Fabricating can also provide precision CNC laser cutting. Our new Amada 3-Axis, self-loading, fiber laser cutting system can run 24/7 without personnel, providing fast, efficient production. Laser cutting technology enables the design engineer a limitless ability to create the most complicated shapes and the ability to use materials that are traditionally difficult to cut with established stamping methods. Low to medium volume is ideal for laser cutting and tooling costs are virtually non-existent. There is also quicker turnaround from your design to production level parts in hand. 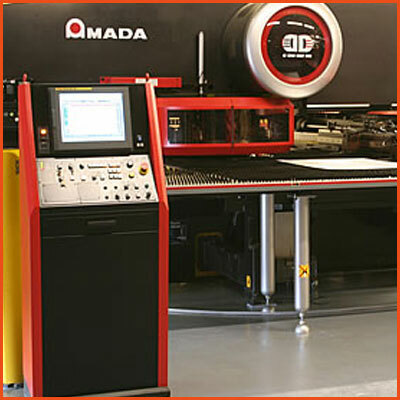 Accurate's laser cutter is the powerful and precise Amada FLCAJ 3015 3-Axis Fiber Laser Cutting System with the optional automated loader/unloader, allowing 24/7 production. Our capabilities and expertise provide our customers solutions for a wide range of materials like carbon steel, aluminum, and stainless steel. 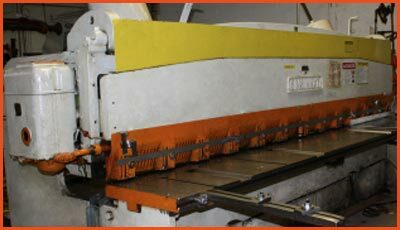 This machine’s capacities enable us to handle sheets 5 feet wide, 10 feet long, and up to 5/8” thick. With multiple state-of-the-art machines, hundreds of tools, and seven decades of experience, Accurate can handle essentially any forming, bending, welding, perforating or cutting request. Furthermore, our new laser cutting machinery that is automated so it can run 24/7 without personnel, provides you with fast turnarounds at a great price. Contact us today to discuss your needs. 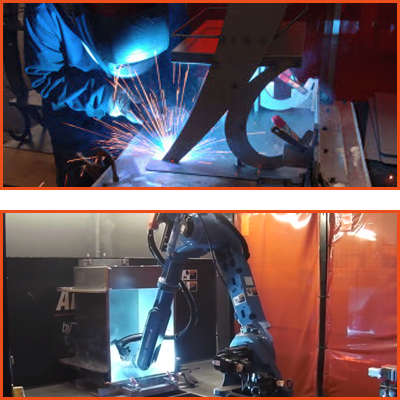 Accurate Metal Fabricating's precision welding capabilities rise to the top with our latest addition of a Motoman robotic welder to our welding cell. We provide our customers cleaner, more consistent welds while offering more precision and flexibility in hard-to-reach areas. Accurate has the capabilities and the experience to weld metal as thin as 28 gauge up to 1" along with thin gauge aluminum. Additionally, we are well-versed on how to weld various kinds of metals like carbon steel and stainless steel. 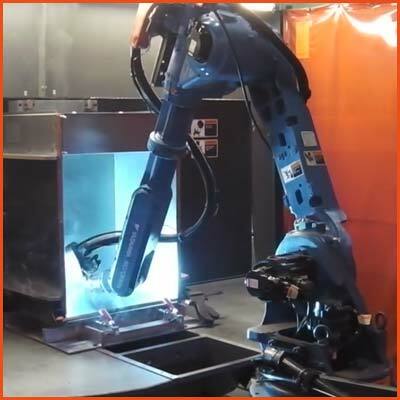 We offer many different welding processes including MIG, TIG and spot welding, along with our Motoman HP20D-6 DX100 robotic welder with a Fronius cold metal transfer MIG welding unit. Our additional capabilities enable us to partner with our customers to meet challenging quality standards through precise heat control and exact penetration, join corner edges of thin materials, and achieve repeatable results time after time. Precision—it’s the essential capability for quality metal fabrication. Accurate Metal Fabricating brings precision to every area of fabrication, including light stamping. Light gauge stamping and decorative stamping can bring your product to a new level of showmanship. Can handle parts smaller than a nickel, thinner than a dime. Can handle light gauge sheet metal up to 11 gauge. AMF’s modern high-speed equipment features robotic systems with automatic transfers. This is precise and cost efficient. 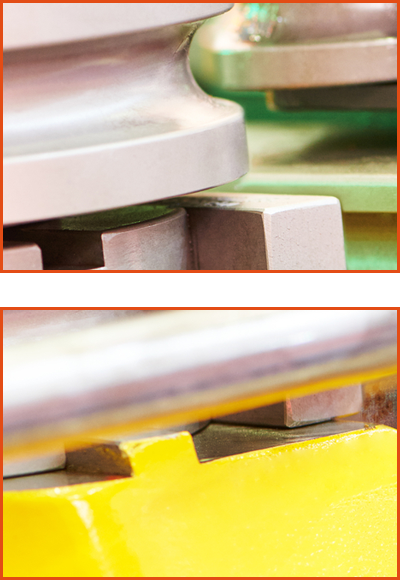 With our press brakes, punch presses, and CNC turret presses, we can handle short to medium-run stamping requirements. AMF has a wide range of press tonnage available, press beds up to 60 in. x 100 in. and an immense tooling library maintained by Accurate Perforating. We have the essential equipment to meet your light stamping needs. A skilled team of engineers to ensure that your order meets exact specifications. Our clients are engineers, designers, OEMs, and distributors; we work with them on prototype development to ensure that each unique design is fully functional. We’re proud of our ability to handle essentially any fabrication request you may have. Accurate has the complete solution for your sheet metal fabricating requirements. We have numerous shears with various capabilities to fit your product requirements. Our shears are capable of cutting metal up to 1" thick and 10' wide. 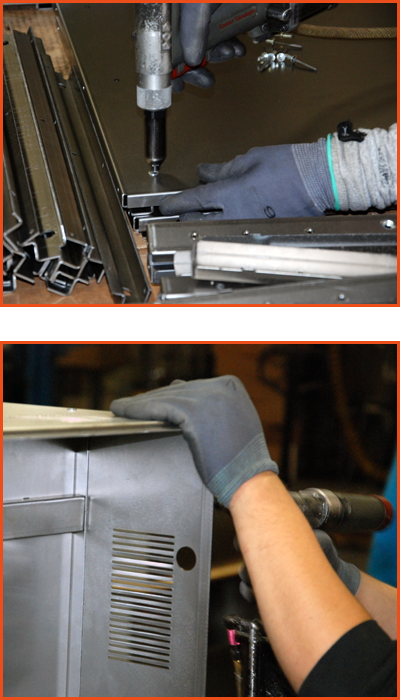 We have specialized conveyor shears with the ability to cut over 100 pieces per minute with tight tolerances. With multiple machines, hundreds of tools, and seven decades of experience, Accurate can handle essentially any forming or bending request. No matter what type of metal tube you require, we can provide the tubular fabrication for your components: bent tubing, tubular frames, rectangular tubing, perforated metal tubes, beaded tubing, traight cut tubing, mitered cut tubing. Many fabricated metal assemblies and especially POP displays require tubing. AMF can assist you with any type of tubular components. We offer tubular fabrication in a variety of metal materials: aluminum, stainless steel, copper, brass, and pre-coated metals. Accurate Metal Fabricating has the talent and equipment to handle your most complex tubing components. Our laser cutter is a precise and powerful 3500 W Mitsubishi CNC Laser System. 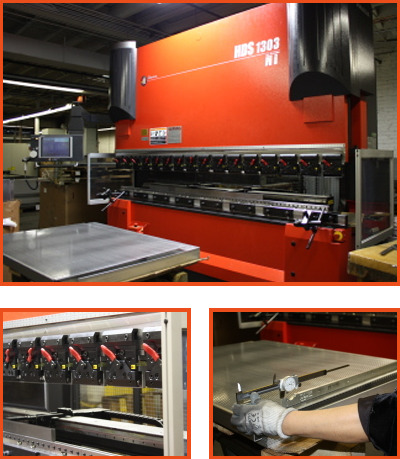 AMF’s multiple Amada and Accurpress press brakes provide our customers high-quality, precision forming for tubing. And our CNC Accurpress press breaks offer solutions to bend materials with lengths up to 6 feet. Accurate Metal Fabricating can integrate specialized PEM® brand fasteners into your design projects. PEM® Insertion yields strong, permanent, threaded fasteners and mounting points for PC boards, electronic enclosures, brackets, shield covers and other accessories. A PEM® nut is an internal fastener that as an assembly alternative provides strong, load bearing threads to thin sheet metal as well as to non-malleable materials. We can utilize surface mount, weld technology and presses to insert this specialized hardware on your design projects. Joining metal components isn’t always a simple matter with a single method. But Accurate Metal Fabricating always has solutions. AMF has full capabilities to install pop riveting and tubular riveting to join components where the welding process can’t be applied. Our team of experts can determine if riveting is a viable method for your project. And we can advise you of all the best alternatives to enhance assembly for your design. Our team of engineers can make a joint analysis and determine if the installed load would require a tension load or a shear load for your project. We can help you determine whether bolts, welding, or riveting is your best choice for joining components. We have capabilities for any option, and can help you determine which best suit your project needs. Sometimes welding can be applied, but riveting is the best choice because it can save you money. See our case study for how we gave one client substantial savings by substituting riveting for welding. We offer first article inspection to ensure the quality of your component, at the best price for you, before we undertake the final production run. We have the seven decades of experience, state of the art equipment and the capabilities to offer you more options for your design assembly.